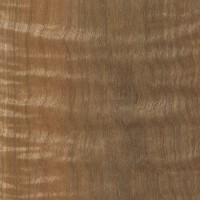 Color/Appearance: Heartwood typically golden to reddish brown, with paler yellow/gray sapwood. Colors tend to darken with age upon exposure to light. Curly grain figure very common in this species, with some pieces exhibiting outstanding curl. Grain/Texture: Grain is usually straight, though some pieces have wavy or interlocked grain; texture is moderately coarse and uneven; good natural luster. 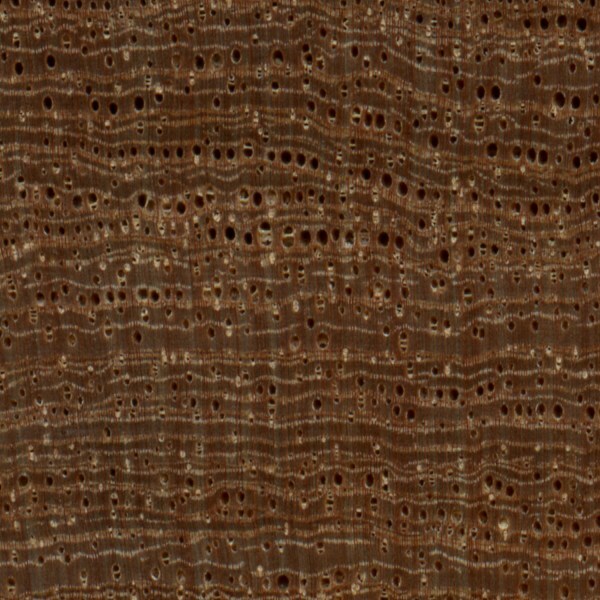 Endgrain: Ring-porous or semi-ring-porous; medium to large earlywood pores arranged in intermittent tangential rows with medium latewood pores, few; solitary and radial multiples of 2-3; tyloses common; narrow rays not visible without lens, spacing close to extremely close; parenchyma banded and marginal. Rot Resistance: Rated as moderately durable to durable regarding decay resistance, with intermediate resistance to insect attack. Workability: Generally easy to work, producing good results, though pieces with curly grain (as with any species of figured wood) will be inevitably more difficult to plane and machine without tearout. Doesn’t have the blunting effect on cutters that true satinwoods exhibit. Turns, glues, and finishes well—polishes to a high luster. Allergies/Toxicity: Besides the standard health risks associated with any type of wood dust, no further health reactions have been associated with Pyinma. See the articles Wood Allergies and Toxicity and Wood Dust Safety for more information. 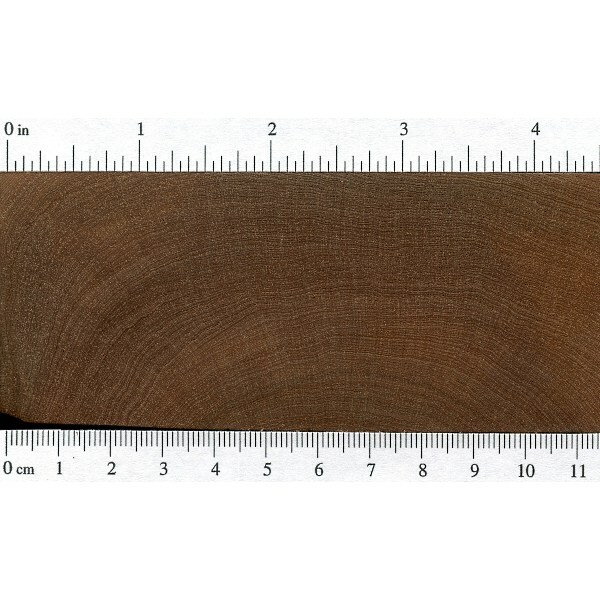 Pricing/Availability: Prices are generally moderate for an imported wood. 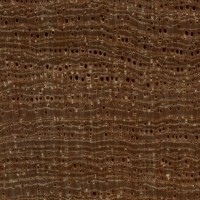 Pieces exhibiting an exceptional amount of figure may be more expensive, but Pyinma is generally priced very reasonably, even for figured wood. Common Uses: Furniture, boatbuilding, general utility work (within its native range), turned objects, and other small specialty items. 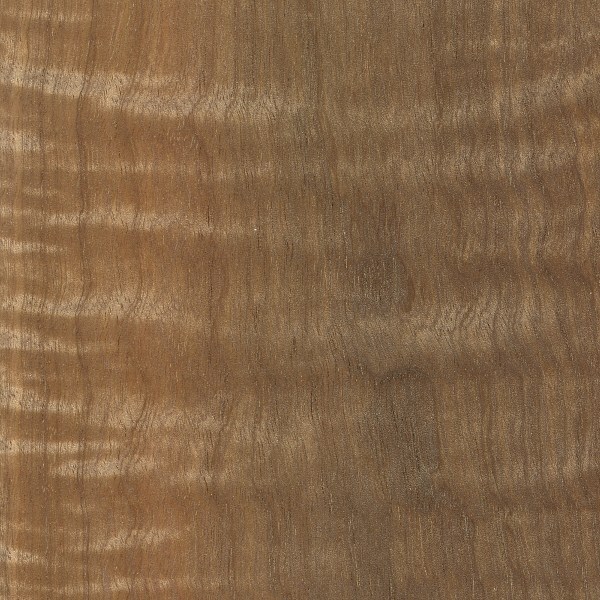 Comments: It’s hard to tell if the wood is being selectively imported on account of its figure, or if the tree naturally produces a high percentage of curly figure, but from a wood buyer’s perspective, Pyinma is perhaps the curliest wood around. Nearly every piece shows some measure of curly grain, with some pieces having an almost three dimensional look on account of the heavy curl. 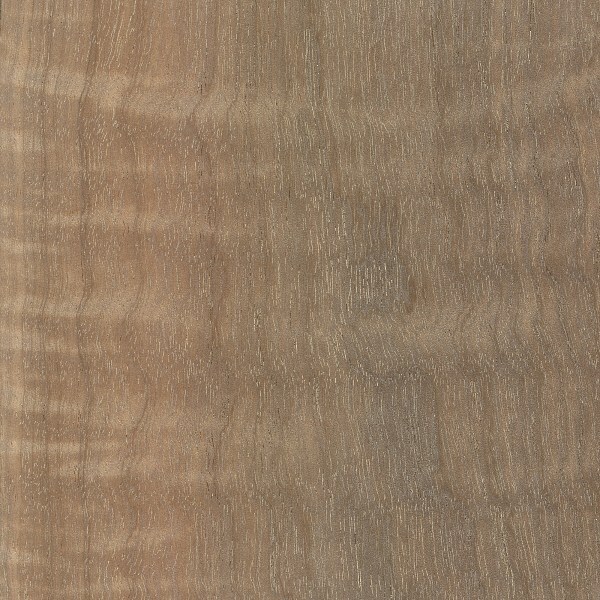 Unfortunately, Pyinma is being widely marketed today as “satinwood,” (or perhaps under slightly less confusing terms, such as “Asian satinwood,” or “Cambodian satinwood.”) Yet with the exception of it’s fantastic figure, Pyinma has little in common with the wood species that have been traditionally called satinwood, (it’s softer, lighter in weight, darker in color, much more porous, and of a coarser texture). 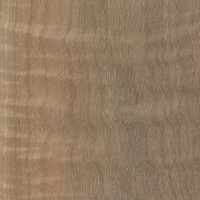 But misnomers aside, Pyinma is still a great wood for many fine woodworking projects. Related species of Pyinma, such as Lagerstroemia indica, are commonly sold as ornamental trees, and are referred to as Crepe Myrtle. I’ve got logs upon logs of the stuff here in Taiwan. We call it “monkey is afraid to climb” or sometimes “9 bows tree”. Evidently monkeys won’t climb it due to its slippery bark. It makes a good bow, so maybe that is where the other name comes from. I’ve seen it get to truly monstrous sizes in the wild and I do mean monstrous because it looks like living dinosaurs or something out of a sci-fi book when it gets that huge. I’ve seen one larger than three people could wrap their arms around and was full of pockets of rot giving it a bizarre look. Bugs love the wood, so it is difficult to dry it without it getting infested. Besides that, it is a wonderful wood for just about anything. I have a bunch of the trees on the property, most thin and fairly useless, but I did harvest a few thicker trunks, but still haven’t found a way to keep them from splitting when drying. The few pieces I’ve salvaged and dried have turned out to be wonderful pieces for tool handles and such..very hard and durable. It’s not the easiest wood in the world to plane, but once planed it produces a very smooth, hard and shiny surface. I’m thinking of making a few hand planes with the wood. Anyone have experience with crepe as plane material? By the way Quiara, it’s among my most misspelled words. I try to remember the correct spelling, but you know..My 60 year old brain ain’t what it used to be. We have several on the property and they grow very fast initially, but trunks seem a bit slower to develop and seldom grow straight once developed. I’m very interested in taking a few thicker pieces to build things with, but it’ll be awhile waiting for them to get big enough to do much with without sacrificing the few show trees in the yard. Most are more like weeds. As a southerner who has many crepe myrtle on her property, not all of us don’t realize that “crepe” is pronounced “crape” – but that one of them isn’t an actual word. This is related to Lagerstroemia indica, also known as the common crepe myrtle. The common garden plant, while not large enough to produce lumber, can produce some very nice, hard, and stiff wood for canes, walking sticks and small turnings. It works well, has decent hardness and a nice white appearance when harvested from the smaller varieties. 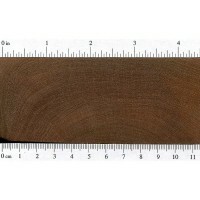 Used this wood Pyinma for a pen blank. The wood is a bit soft but easy to finish. 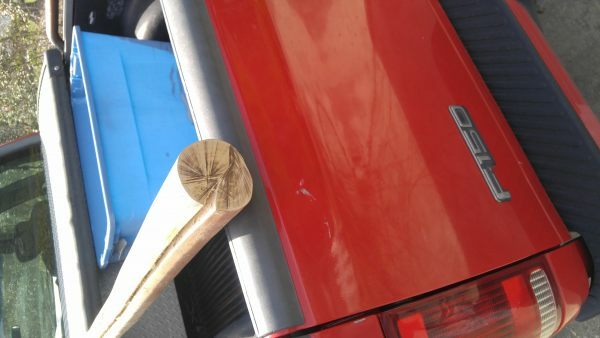 No blow outs of the wood when turning. Very fine and light figuring and a bit of satiny shine. Very enjoyable working with this wood.